Jaya Lakshmi kirtan albums include devotional chanting. Jaya Lakshmi is dedicated to the deep devotional mood of Indian singing and music. She was initiated by Srila Govinda Maharaj, and given her spiritual name, “Jaya Lakshmi”, which means “victory to the goddess Lakshmi”, the Hindu goddess of fortune and spiritual wealth. Jaya Lakshmi is, without a doubt, one of the most innovative, creative artists in the realm of contemporary chant music. Spiritual as well as sensual, her music is an intoxicating mix of mystical sonorities: ethereal Vedic chants that lift the soul up high, percolating tabla beats that make you want to move, cutting edge dance grooves, harmonium drones and even a little Gypsy spice thanks to the use of flamenco guitar. It"s music for dance and deep trance all wrapped up in one, providing the perfect accompaniment for yoga, ecstatic dance or chilling out. Born into a family of musicians, Jaya Lakshmi's natural talent for creating music developed early. Raised with piano lessons and horses, she began writing songs on the guitar at age 15 and was in a band in high school that performed originals and covers of popular folk songs with four-part harmonies. After graduating from the University of New Hampshire in 1985 with a degree in Anthropology, she moved to rural Western Oregon where she resumed her songwriting and singing, inspired by the lush green forests, misty mountains, and the ring of the twelve string guitar. After 5 more years of chilly winters, she moved with her two-year-old daughter to the big island of Hawaii where she was introduced to Srila Govinda Maharaj from West Bengal India, from whom she received harinam initiation and her spiritual name Jaya Lakshmi, which means "victory to the goddess Lakshmi," the Hindu goddess of prosperity. The Hawaiian Islands, known for their rich spiritual energy, have opened the door to many faiths. Here, Jaya Lakshmi made a profound connection to her own Native American ancestry through traditional ceremony and the singing of their powerful medicine songs on the Big Island and Maui, where she moved in 1996. It was on Maui that she met up with Deva Priyo and Om and formed the band Lost at Last, which officially marked the beginning of her professional music career. The vision of the band was to blend ancient and modern music (acoustic and electronic) in a mood of love and devotion, with chanting and devotional singing. The formula was bound to make waves! The band finally relocated in Northern California and Oregon, in order to keep building their growing fan base on the West coast. Jaya Lakshmi performed as the lead singer and keyboardist, as well as playing the harmonium, 12-string guitar and various percussion instruments. She is a prominent songwriter in the band, who's first major release titled "Lost at Last," was released in August of 2001. The albums joyous, ethno-centric energy was enhanced by Lakshmi"s contributions as lead singer and keyboardist, as well as her accompaniment on harmonium, guitar and percussion. Her experiences working with other well-known artists also continue to develop. 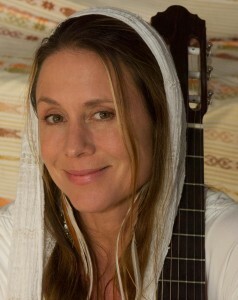 In the spring of 2001 she co-wrote and sang two songs on William Ackerman's new CD, "Hearing Voices", on RCA/Windham Hill records, which garnered a Grammy nomination for best New Age album. While in 2002 she contributed vocals for Steve Gordon's CD Drum Prayer on the Sequoia Records label. These projects reveal her beauty and versatility as a singer and songwriter as she continues to blossom as an artist. In Nov 2002, Lakshmi became a Sequoia Records artist with her debut sacred chant solo release Ocean of Mercy, released in April 2003, title is overflowing with Lakshmi"s blissful, heartfelt and passionate devotional singing of ancient Vedic chants blended masterfully with sarod, chill out electronica grooves and flamenco guitar. Her follow-up album, Jewel of Hari, released in March of 2004 features more of her signature sound; only this time with an even warmer, more intimate feel. This release quickly hit the iTunes Music Store"s New Age Top 10. Next Lakshmi teamed up with producer Steve Gordon to release her most refined and beautiful album yet, Sublime, which is a perfect meeting of sacred chant and electronica. Lakshmi has recently completed work on her fourth Sequoia Records release, Radiance. Again produced by Steve Gordon, it is a more intimate and acoustic set of songs that are ideal for yoga and meditation. Lakshmi continues to regularly lead kirtan chant performances to growing and receptive audiences up and down the west coast with her fellow band-mate, Deva Priyo, on sarod & guitar, and has established herself as one of the leading kirtan chant singers along with her contemporaries Jai Uttal, Deva Premal and Krishna Das in today"s blossoming sacred chant music scene.